Article and lead photo by Bobby Sanghera. The Vancouver Park Board is currently undertaking an initiative called VanPlay, which will result in a 25-year masterplan to guide the creation and maintenance of parks, community centres, and recreational facilities within the city. Community engagement around the “playbook” incorporates themes such as: community and vision, space and equity, ecology and nature, celebration and diversity, resilience and wellbeing. The “Phase 1 Engagement Report” was released last year, and it describes the technical progression of this “yearlong public discussion about the future of parks and recreation.” The whole project is anticipated to be complete by the summer of 2018. 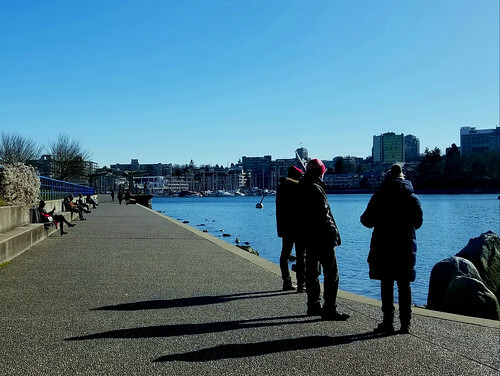 The VanPlay conversation has got me thinking about the origins of the park spaces in which we learn, laugh, and play – and about about these spaces do (and sometimes don’t) afford residents and newcomers the opportunity to recreate and connect in safety, comfort and with peace of mind. What sorts of features makes a park a park? Does a park need a playground? Do we need seats or benches in a park? Does a park require an abundance of grass, or does a little suffice? Can a beach be a park? Why is one park better than another? More importantly, why are some parks full of life while others are abandoned and desolate? The Seawall as it runs along the edge of David Lam Park. Photo by Bobby Sanghera. On February 12, 2018, B.C. Family Day, I decided to visit David Lam Park located near the south side of Yaletown. The park is located near a number of high-rise residential buildings, shops, offices, and the popular Roundhouse Community Centre. Residents and visitors make use of the lawns for gathering and picnics, or, depending on their age, get more active on the playground, tennis and basketball courts, or the prominent large field (whichs hosts soccer, volleyball and other team sports). 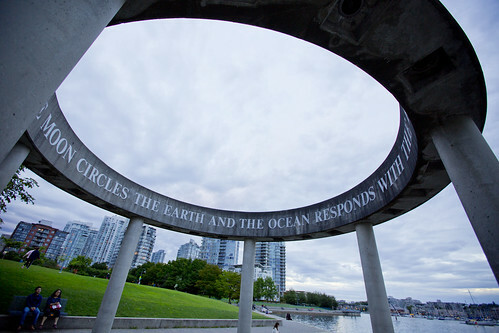 Cyclists and pedestrians make use of the Seawall, sometimes stopping to gaze at False Creek, and the public art features located along its edge. During key weekends in the summer, the popularity of this park extends further as it serves as a key venue for the Jazz festival. It’s this mix of uses that provides at least part of the answer to my questions. A good park, it would seem, is so much more than just a mere place to have your lunch or a place to take an afternoon stroll. Considered in its most holistic sense, a park is an inclusive, layered, and diverse space that benefits when also surrounded by a range of other uses. A panorama of David Lam Park. Photo by Dennis S. Hurd. A park also works best when it aligns with the needs and desires of the users that interact within the dynamic space. The little things that make up the park, such as: benches, boardwalks, and even particular sightlines, must incite a feeling of yearning, appeal, and participation that incentivizes particular sentiments that are unique to each location. That would imply that the success of such a place is ultimately determined through the various components that allow the park to be noticed, desired, functional, and comfortable. Jane Jacobs, in The Death and Life of Great American Cities (1961), argues that the fundamental requirement of neighbourhood parks is consideration for the arrangement of things that invite “liveliness and variety [which, in turn] attract more liveliness” (Jacobs, 98). Jacobs goes on to describe four characteristics that are essential to the conservation of liveliness within a park: The importance of various focal points in the park (centering), the exposure to sunlight (sun), the implicit and explicit boundaries that makeup the park (enclosure), and, the characteristic I’ve been emphasizing, the organization and prearrangement of a park (intricacy) (103). According to Jacobs, it is the grouping of objects in a park or, “[the] subtle expressions of difference” (104) that catch the eye of users operate as a stimulus that invites intrigue, exploration, and discovery. The experience of a particular space, such as David Lam Park, is an experience that is determined through factors that provide a measure of satisfaction – and, hopefully, happiness – to the user. This includes its many distinct features (including its intriguing public art along the shoreline, warm pavers and fountains, and mix of facilities), as well as the connections to through a space, the visibility and arrangement of features in the landscape, the nature of materials, the presence (and design) of supports such as seating, washrooms, and the variety of spaces that invite mutual uses amongst a diversity of users. Public art along the edge of Yaletown Park. Photo by GoToVan. The creation and conservation of our neighborhood parks needs to embrace these human-centered elements. David Lam is an excellent park, but not all of our parks are created to this standard. As we look to the future of parks in the city, it’s important to acknowledge that under-used or unloved park may have unique challenges to overcome. Not all parks can be made perfect, but the opportunity to create a long-range plan like VanPlay is also an opportunity to shed light on the things – big and little – that can help our neighborhood parks become ever more more inclusive and beloved. Let’s do our part to make sure that all our parks are designed to respond to the needs of our neighbourhoods and their residents. You can learn about the VanPlay process by clicking here or visiting the next VanPlay Community Dialogue on April 10, 2018, from 6:30 pm to 8:30 pm (the location is still to be determined). UPDATE: We’ve been advised by the Park Board that the next VanPlay Community Dialogue is being rescheduled to May 2018 – final date and location TBD. Please visit their webpage and sign-up for updates about this and other VanPlay events. Bobby Sanghera is an aspiring Urban Planner and is passionate about social planning. He has lived and worked in Vancouver his whole life and is fascinated with the growing concerns of his local communities. References to Jane Jacobs are from the The Death and Life of Great American Cities. New York: Random House, 1961. p. 89 – 111.